I’ll never forget what wonderful Edna Chase, the doyenne – the goddess – the former of taste, discretion and elegance – sending a memo to us in the bombing, that she noticed we weren’t wearing hats and she didn’t approve that we dyed our legs and made lines up the backs to simulate stockings – (Britain had no nylons until the US Air Force brought them in as rich presents) – and I happened to be in charge of the office that day, though it was none of my affair to answer the boss, I sent a cable in my own name: We have no ration coupons and no nylon stockings anyway. The next week every member of the staff was sent three pairs. – Lee Miller, (1907-1977) American fashion model, photographer, and war correspondent for Vogue magazine (WWII). This quote is from a letter Ms. Miller sent to her brother during the London Blitz (German bombing of the city), happening in the early years of World War II. At the time she was living in London with the artist/photographer Roland Penrose and working for Vogue as a fashion photographer. Later she traveled to the Continent as a war correspondent, also for Vogue. I’ve been fascinated with Ms. Miller ever since I attended the exhibit The Art of Lee Miller at the Victoria and Albert Museum in London. I was and continue to be captivated by the many facets of her artistic talents. 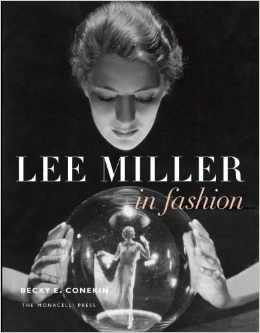 Currently I’m reading Lee Miller in Fashion, by Becky E. Conekin. BTW, Edna Chase was the editor in chief of Vogue from 1914-1952. She’s also quite a story.